I had really high hopes for Wishes for Christmas as I used to love The Sisterhood series of novels back when they first came out. I remember reading the first book in the series on one of my summer vacations, sitting on the twin bed my dad got for me for the summer (I still lived in NY at the time and was only in California for the summers. I don't know if I just grew out of the series or if they just got so unbelievable that I couldn't read them anymore. I think it might be a combination of both. When I saw this available of Netgalley, I decided to get back into it. Big mistake. 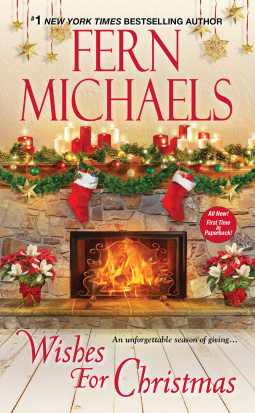 Wishes for Christmas isn't one full novel, but three (possibly) interconnected novellas involving The Sisterhood and The Godmothers (never heard of this one). In the first novella, the Sisterhood sets out to find one of the member's teacher from when she was a kid. This teacher was a big part of Maggie's (the "sister") childhood and she's blamed herself for something that happened 27 years ago. This is supposed to be a romance, but I don't see it. There's nothing happening between Maggie and the guy Fern Michael's website says is her fiancé. I vaguely remember them from before I stopped reading the series (at least I think it is them) and I remember liking them a lot. Here, I've barely seen him and I think she's an idiot. My biggest issue with this is that it is so disjointed and reads almost as if it is someone's dream--you know the type: where you bounce around from scene to scene without anything connecting them at all. I don't remember her books being like this, but maybe they were and I'm just remembering them through rose colored glasses. Wishes for Christmas will be available on October 27th.